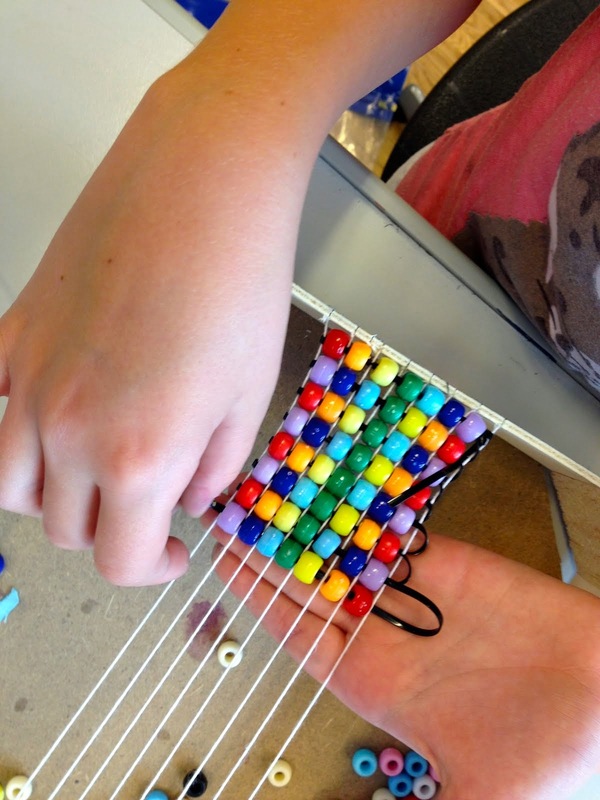 This is another great idea from Deep Sparkle Space. I have to come up with new ideas constantly because my after school classes are mixed grades and some of the children come back every term. I'm leaning heavily on Deep Sparkle Space for new ideas! 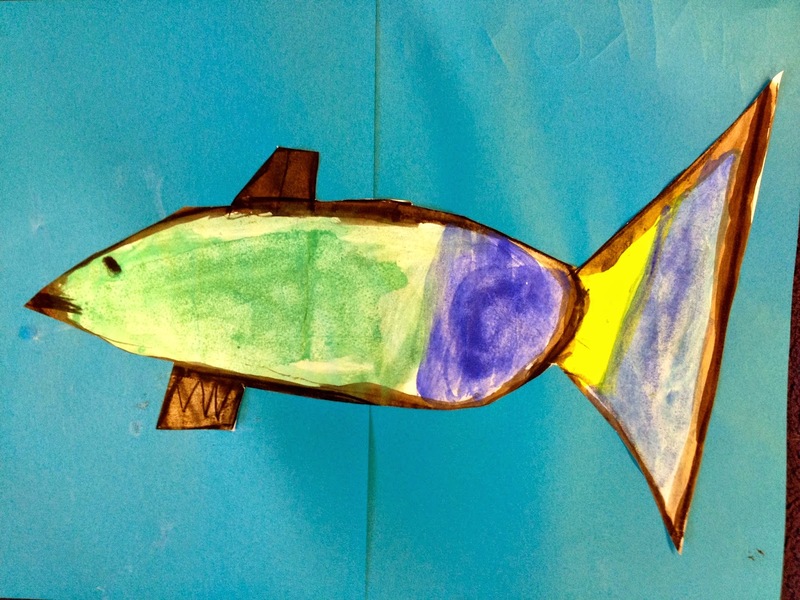 For this project we looked at some drawings of different kinds of fish. I told the children they could make an imaginary fish. Look! 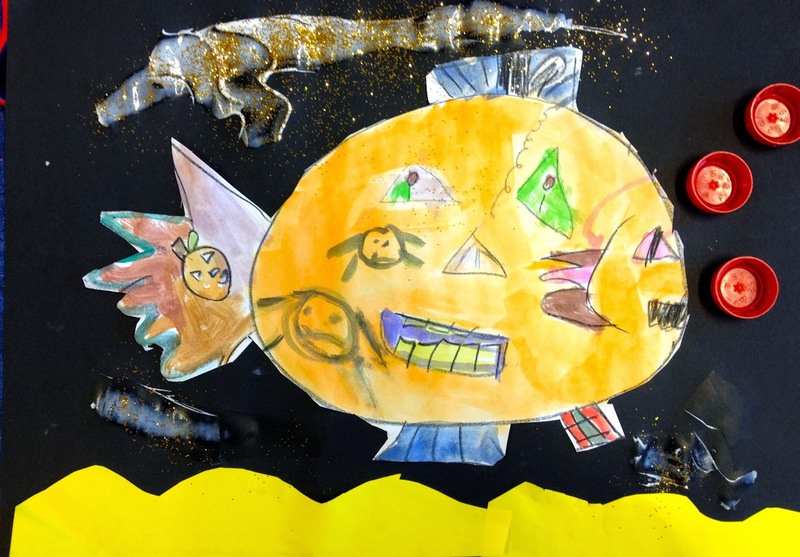 This is a jack o' lantern fish, with bottle cap bubbles! 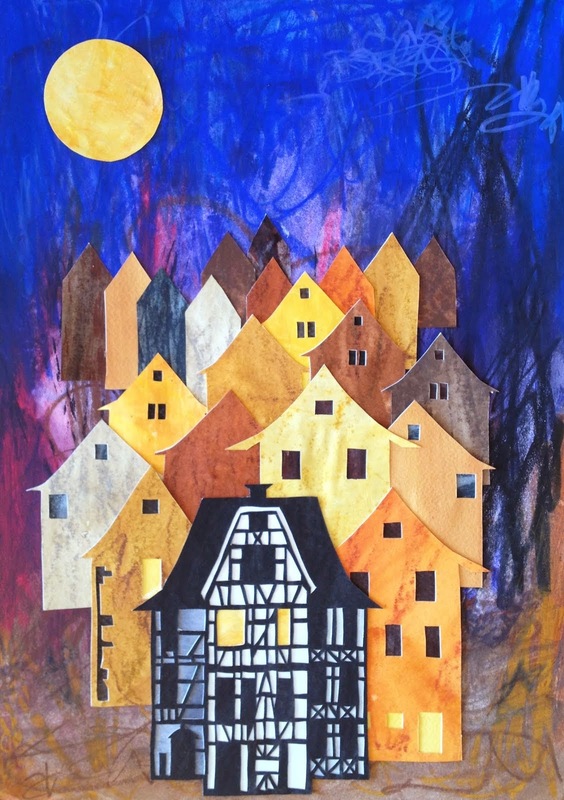 They drew with a black wax crayon and then watercolored. 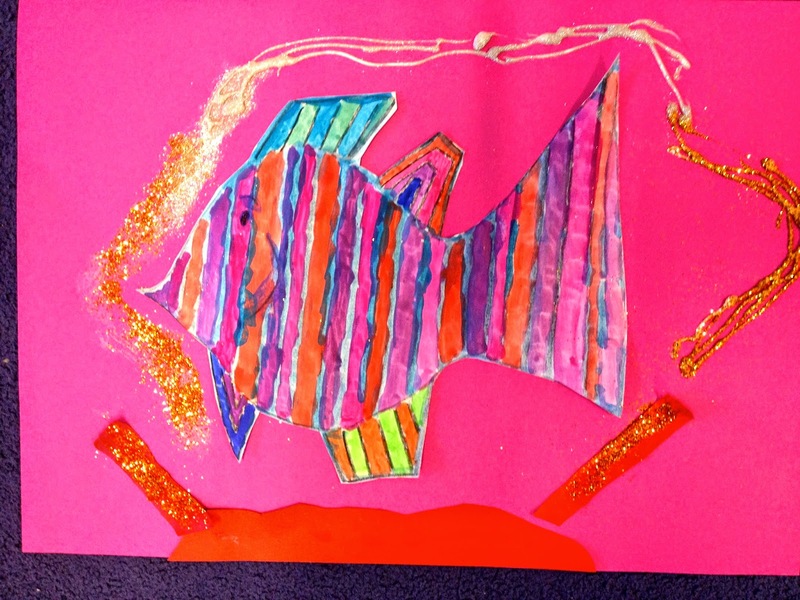 After gluing their fish on to the background color they had picked, I encouraged them to add some details like coral, plants, or other fish. This artist chose not to add anything, but went on to create a paper boat that floated in the sink! I'm glad the homeroom teacher was still in the class to encourage the experiment. This fish is swimming up. 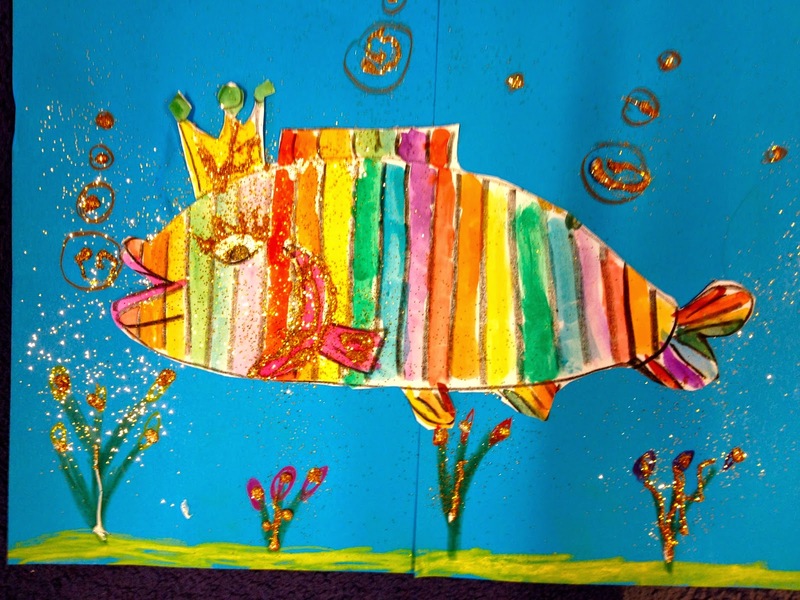 Look at the fish's yellow and pink crown. 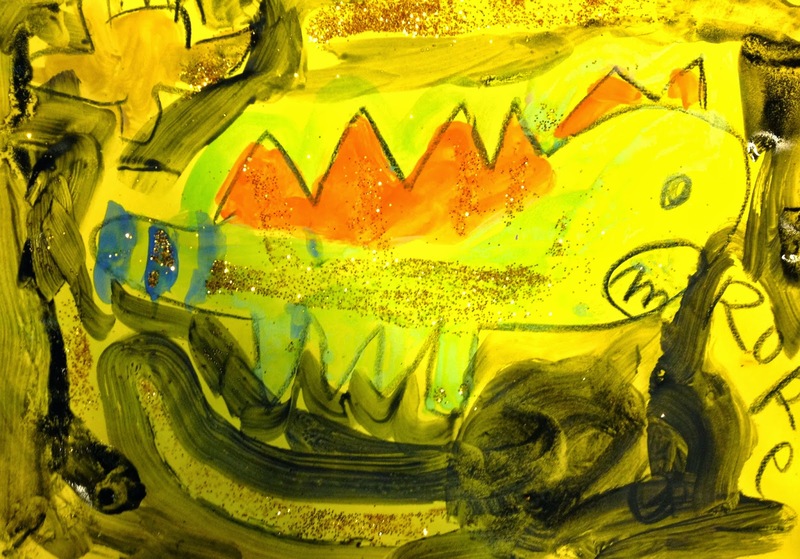 After each child's picture was finished they could add glitter! I always try to have a glitter project since most children don't get to do that at home. 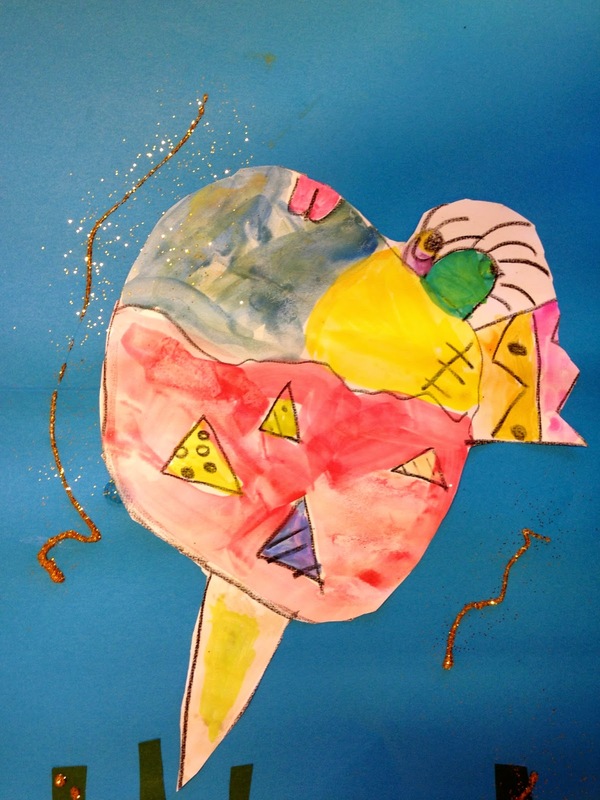 This artist added bubbles and plants with watercolor and crayon. 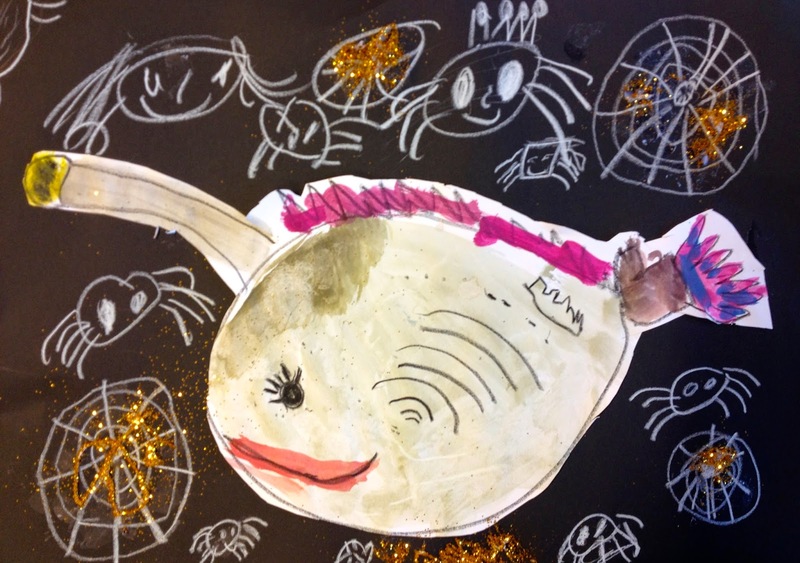 A lot of spiders and spiderwebs showed up under the sea today because Halloween is coming. 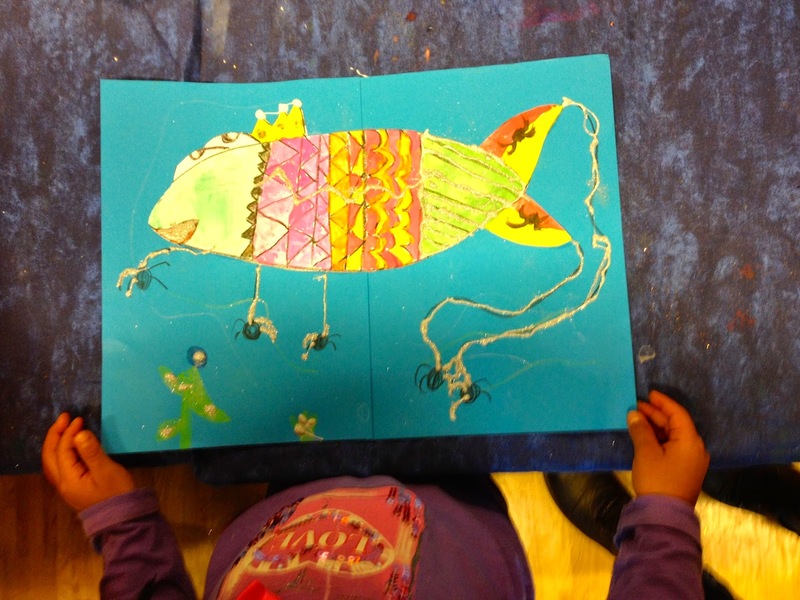 This is a lantern fish, surrounded by lots of spiders and their glittery webs. 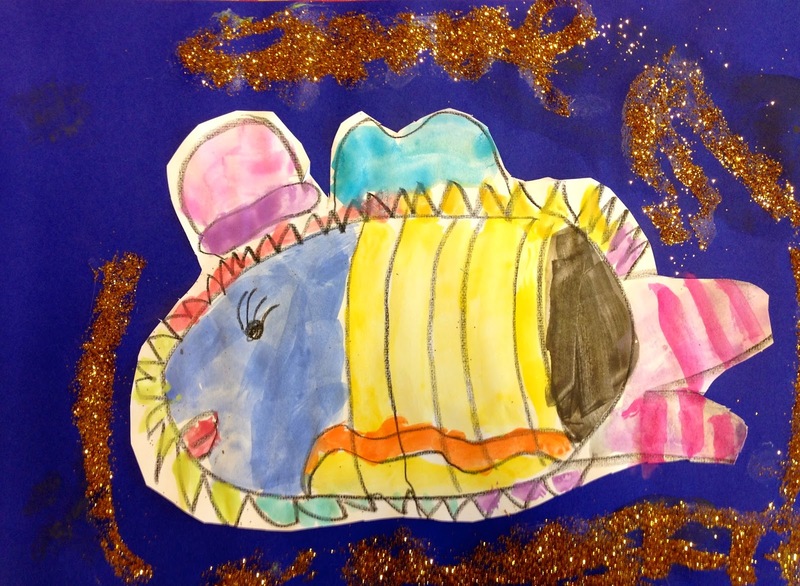 I love this fish's jolly little hat and many stripes. 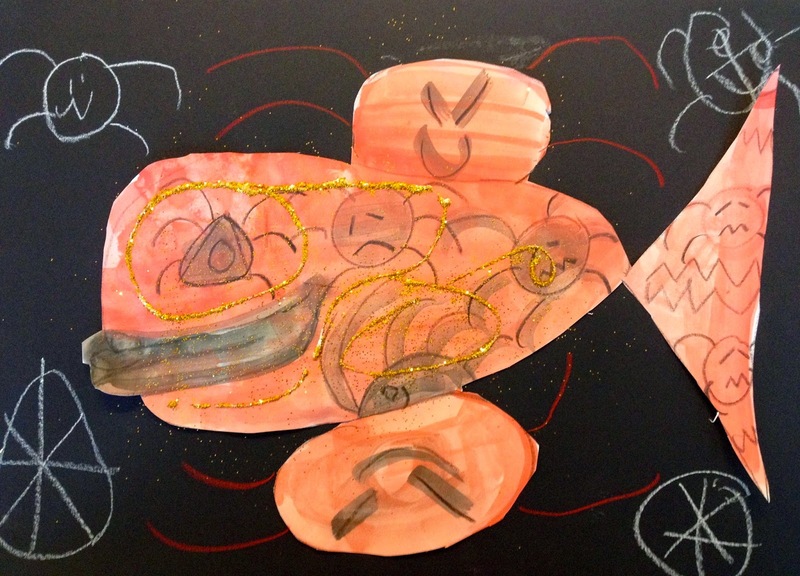 I forgot to mention to the children that it would be easier to cut out a fish with a smooth outline. Wow! I get inspired when I see colors like this! Who says the sea has to be blue or black? More gorgeous stripes, plus some very beautiful undersea plants which are like little bouquets. 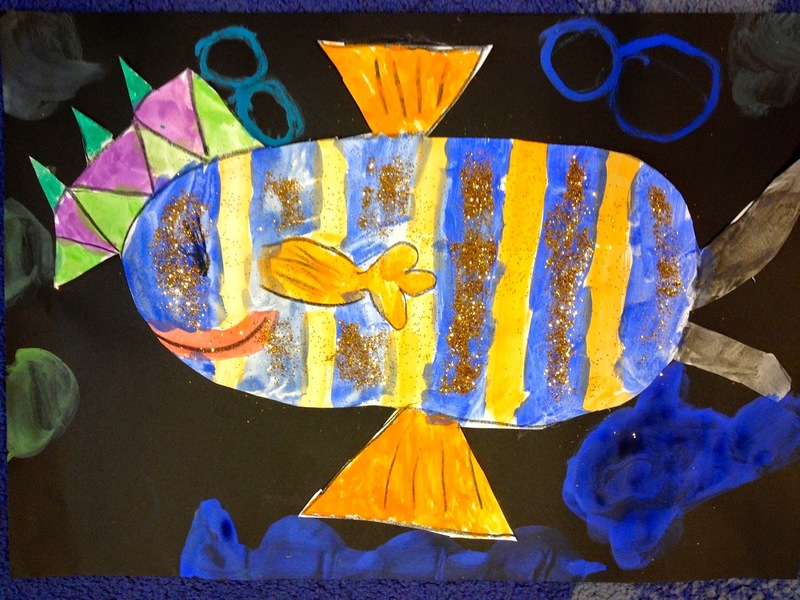 It looks like spiders are spinning glittery webs from this fish! 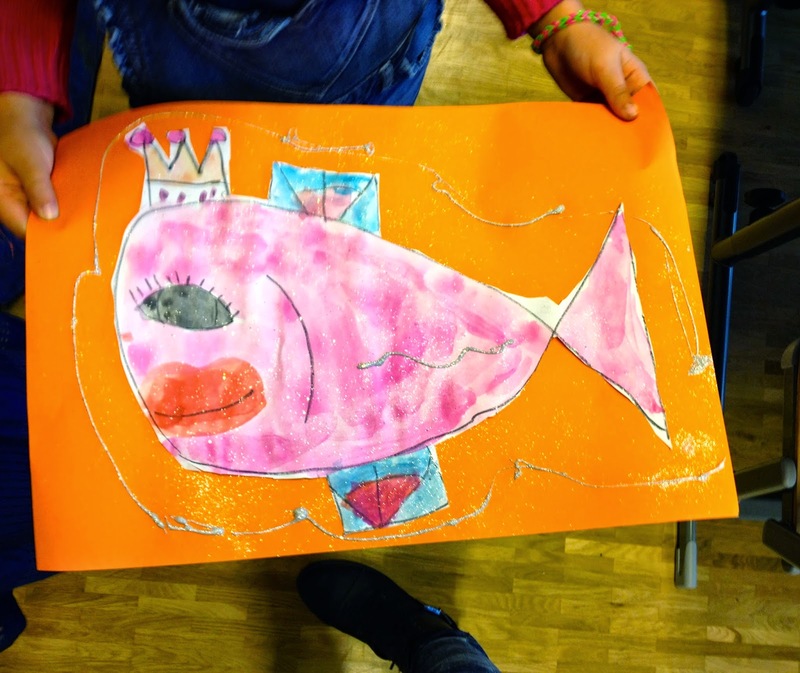 A final very feminine fish with a crown, and a bonus painting below. Some of the children had some extra time and asked if they could do inventions. A few weeks ago Chloe said she loves it when she gets to "imaginate." I like it, too!